I came across this Japanese fairy tale, and I had to share. Because it features a well-meaning crab, an evil unrepentant monkey, and horrible, sweet revenge. Which makes it just about the perfect story, although I'm not sure why anyone would tell it to a child, except perhaps some in the business of making commissions for referrals to psychotherapists. Seriously, this story is messed up. In a charming, Japanese way. And there's probably some kind of political analogy here, too. Like Democrats Republicans Tea Partiers Liberals someone you don't like is ruining the country with their profligate rabble-rousing tax-and-spend intolerant interventionist agenda. I'm sure you'll see something if you squint hard enough. Anyway, enjoy the story of The Quarrel of the Monkey and the Crab. Now though the monkey is always very fond of persimmon fruit, he had no use for the seed he had just found. The persimmon-seed is as hard and uneatable as a stone. He, therefore, in his greedy nature, felt very envious of the crab's nice dumpling, and he proposed an exchange. The crab naturally did not see why he should give up his prize for a hard stone-like seed, and would not consent to the monkey's proposition. "How unwise you are not to think of the future! Your rice-dumpling can be eaten now, and is certainly much bigger than my seed; but if you sow this seed in the ground it will soon grow and become a great tree in a few years, and bear an abundance of fine ripe persimmons year after year. If only I could show it to you then with the yellow fruit hanging on its branches! Of course, if you don't believe me I shall sow it myself; though I am sure, later on, you will be very sorry that you did not take my advice." 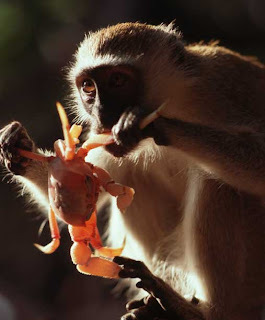 The simple-minded crab could not resist the monkey's clever persuasion. He at last gave in and consented to the monkey's proposal, and the exchange was made. The greedy monkey soon gobbled up the dumpling, and with great reluctance gave up the persimmon-seed to the crab. He would have liked to keep that too, but he was afraid of making the crab angry and of being pinched by his sharp scissor-like claws. They then separated, the monkey going home to his forest trees and the crab to his stones along the river-side. As soon as the crab reached home he put the persimmon-seed in the ground as the monkey had told him. In the following spring the crab was delighted to see the shoot of a young tree push its way up through the ground. Each year it grew bigger, till at last it blossomed one spring, and in the following autumn bore some fine large persimmons. Among the broad smooth green leaves the fruit hung like golden balls, and as they ripened they mellowed to a deep orange. It was the little crab's pleasure to go out day by day and sit in the sun and put out his long eyes in the same way as a snail puts out its horn, and watch the persimmons ripening to perfection. At last, one day, he knew the persimmons must be quite ripe and he wanted very much to taste one. He made several attempts to climb the tree, in the vain hope of reaching one of the beautiful persimmons hanging above him; but he failed each time, for a crab's legs are not made for climbing trees but only for running along the ground and over stones, both of which he can do most cleverly. In his dilemma he thought of his old playmate the monkey, who, he knew, could climb trees better than anyone else in the world. He determined to ask the monkey to help him, and set out to find him. You can imagine the feelings of the poor crab after waiting patiently, for so long as he had done, for the tree to grow and the fruit to ripen, when he saw the monkey devouring all the good persimmons. He was so disappointed that he ran round and round the tree calling to the monkey to remember his promise. The monkey at first took no notice of the crab's complaints, but at last he picked out the hardest, greenest persimmon he could find and aimed it at the crab's head. The persimmon is as hard as stone when it is unripe. The monkey's missile struck home and the crab was sorely hurt by the blow. Again and again, as fast as he could pick them, the monkey pulled off the hard persimmons and threw them at the defenseless crab till he dropped dead, covered with wounds all over his body. There he lay a pitiful sight at the foot of the tree he had himself planted. Now the crab had a son who had been playing with a friend not far from the spot where this sad work had taken place. On the way home he came across his father dead, in a most dreadful condition - his head was smashed and his shell broken in several places, and around his body lay the unripe persimmons which had done their deadly work. At this dreadful sight the poor young crab sat down and wept. But when he had wept for some time he told himself that this crying would do no good; it was his duty to avenge his father's murder, and this he determined to do. He looked about for some clue which would lead him to discover the murderer. Looking up at the tree he noticed that the best fruit had gone, and that all around lay bits of peel and numerous seeds strewn on the ground as well as the unripe persimmons which had evidently been thrown at his father. Then he understood that the monkey was the murderer, for he now remembered that his father had once told him the story of the rice-dumpling and the persimmon-seed. The young crab knew that monkeys liked persimmons above all other fruit, and he felt sure that his greed for the coveted fruit had been the cause of the old crab's death. Alas! The young crab set out at once to call on the mortar, his father's old friend, and told him of all that had happened. He besought the mortar with tears to help him avenge his father's death. The mortar was very sorry when he heard the woful tale and promised at once to help the young crab punish the monkey to death. He warned him that he must be very careful in what he did, for the monkey was a strong and cunning enemy. The mortar now sent to fetch the bee and the chestnut (also the crab's old friends) to consult them about the matter. In a short time the bee and the chestnut arrived. When they were told all the details of the old crab's death and of the monkey's wickedness and greed, they both gladly consented to help the young crab in his revenge. "Can you still lie? I will soon put an end to your breath!" and with that he cut off the monkey's head with his pincer claws. Thus the wicked monkey met his well-merited punishment, and the young crab avenged his father's death.